Kieran Muir won the Lincoln Farms, EZGO Clarks Beach Pro-am today with a solid round which included eight birdies and a single bogey for a score of 64. Muir played precision golf and with a bit of luck may have threatened the 60 barrier. 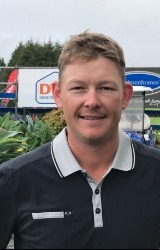 Muir won by two strokes from in form Luke Kwon, yesterdays winner at Pukekohe Hayden Beard, Chang Gi Lee and Troy Ropiha on 66. The course was in great condition and perfect weather set the stage for low scores.